Take a look at almost any component within a computer. Change the case temperature by a couple degrees. It can add or subtract years from the lifespan of your components. That’s because heat is what kills most electronics. Heat-based lifespans are especially common when it comes to graphic card components, like those within the Nintendo Switch. But the GPU is far from the only heat-sensitive component within the Switch. Heat and batteries do not get along very well, either. 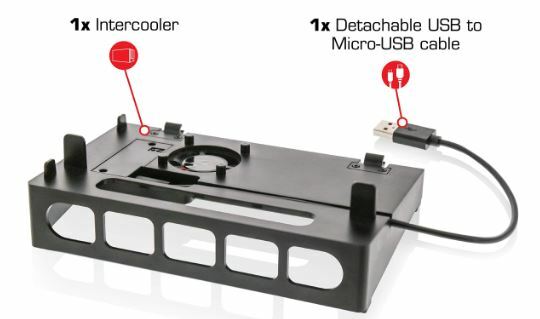 While getting a cooler for your Nintendo Switch might seem a little preposterous at first, with a closer examination, it’s not nearly as absurd as you might think. The Intercooler is basically a docking attachment for the Nintendo Switch. Its internal construction involves one fairly small, well-positioned fan. The chassis of the Intercooler also has been designed to help increase airflow to the Nintendo Switch. But it does more than just cooling, its chassis also allows the docking station to be positioned either vertically or horizontally. Rather unsurprisingly, the size and dimensions of the Nyko Intercooler for Nintendo Switch matches up quite well with the Nintendo Switch. 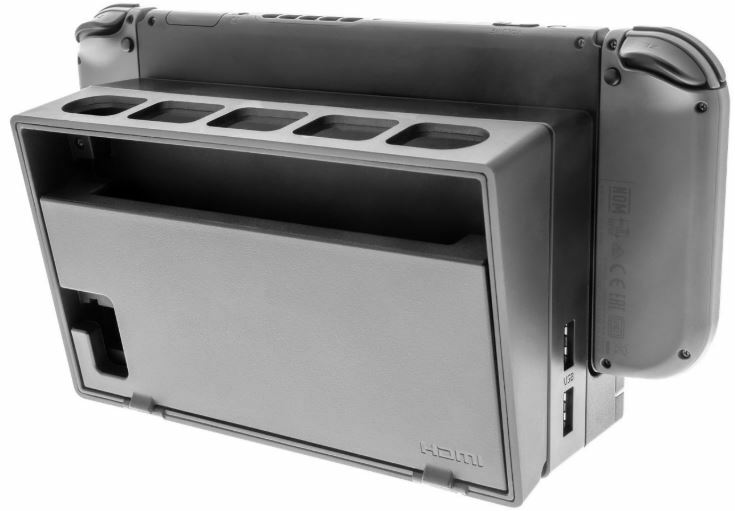 The outside chassis makes use of wide vents, used to maximize airflow to your console. The Nyko Intercooler also uses a modular design which can be adjusted vertically or horizontally, allowing you to stack the Intercooler wherever you need. The topside of the chassis protects your Switch, allowing you to lay it flat, and protecting the Switch from dust. Alternatively, you could maximize storage potential from the Intercooler by using its vents for holding cords, gaming accessories, remote controls, and similar small objects. The Intercooler has such ample airflow that you can afford to block several of these vents. Aesthetically, Nyko designed the Intercooler to match-up closely with the Nintendo Switch itself. Composed of tough gray ABS plastic, the Intercooler is also intended to serve as a sturdy shield between your Switch and potential sources of damage. Capable of handling both heat and impact, ABS plastic is quite durable. And once installed, the weight of your docking station scarcely changes because the Intercooler barely weighs six ounces. Even the fan itself can theoretically be removed and replaced because all of its components are visible and accessible. The USB-powered and USB-connected fan is something we’ll investigate further in just a moment. Does the Nintendo Switch Need a Cooler? Graphics cards are heated to different temperatures, then cooled to different temperatures. Over time, this process creates stress points across the card. Heat has even been known to gradually wear down soldering. Sooner or later, heat breaks things down. And it’s truly unfortunate when your equipment dies because of something as simple as soldering. From a hardware perspective, it takes quite a bit of heat to get the Nintendo Switch shut down. Wait for summertime, wrap your Nintendo Switch up in a blanket. Play your favorite game for a few hours. The Switch probably still won’t give you any issues. That’s because the Nintendo Switch uses an emergency shut-down temperature of about 152°F. But that does not mean it’s good for your hardware to operate at those higher temperatures, especially for longer periods of time. It simply means you can cook your console for a while before the device becomes so warm it has to protect itself from immediate destruction. Higher temperatures are unlikely to cause you problems in the short term, especially with the Nintendo Switch. But heat is a long-term issue. And there are many ways for electronics to suffer problems with heat, not all of which relate to bad design. For example, layers of dust can trap heat. It’s nearly the entire reason why dust is damaging to electronics. In one sense of the word, nobody truly needs a cooling system for their Nintendo Switch. You could try removing all the fans from inside your computer, too. You’d certainly save a few bucks in the short term. But you might also find components dying, one after the next. Cooling prolongs the lifespan of your equipment, it’s generally cheap and non-intrusive, so why not have it? There are even circumstances where it really makes sense to add a cooling fan to your docking station. When you’re storing away a console within an entertainment center, you might cram the console into a small space with minimal ventilation. The Nyko Intercooler can then serve as an added layer of protection to an otherwise slightly-heated environment. It’s hard to get excellent cooling within consoles precisely because they’re relatively compact. And the Nintendo Switch is compact among compact devices. Even with a cooling solution like the Nyko Intercooler, you’re unlikely to ever achieve truly cool temperatures on par with desktop PCs. But the Nyko Intercooler is capable of generating considerably swings in temperature. In the right circumstances, you could expect to see a 20-degree improvement. Those circumstances might include higher ambient room temperature, and weak airflow available to the Switch. Laptops occasionally use docking-style coolers to help stay cool. But because these coolers are generally not designed for one laptop specifically, they have no focus to their cooling. Instead, they get the job done by using bigger fans, often with more cost involved. If you look within the guts of the Switch, you’d notice blowing air across the entire chassis would be a fairly inefficient way of cooling things. 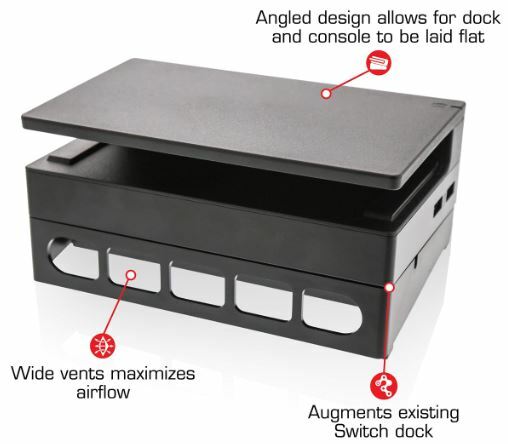 Positioning the fan directly over the hottest part of a docked Switch, the Nyko Intercooler knows exactly what it’s doing with its design. And it’s that smart design which allows it to deliver effective cooling along with little noise and electrical use. One issue inherent to smaller fans is they have a much greater potential to become noisy. But the Nyko Intercooler for Nintendo Switch doesn’t spin fast enough to create those kind of issues. It never spins at such speeds that you start to wonder if someone’s turned on a vacuum cleaner. The fan is quite comparable to the sort you’d find on the backside of a desktop PC. Another smart thing Nyko did with the Intercooler. Its fan is fully automated, making use of built-in thermometers to ensure it triggers spinning only as necessary. In other words, the fan can do its thing without any micromanagement. You can finish playing and walk out of the room, and you don’t have to worry about whether or not you need to turn off or adjust the fan. 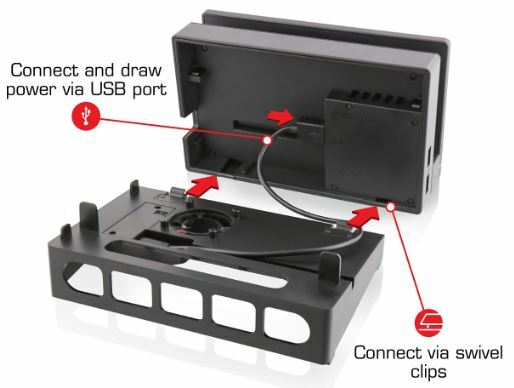 Installing the Nyko Intercooler on your docking station takes about three minutes. The plastic chassis simply snaps onto the side of the docking station, allowing the combined unit to be positioned upright or flat. For the next step of installation, you need to connect the USB to power. That’s a bit easier to manage with the swivel clips positioned along the edge of the chassis, helping keep the USB wire in place. And that’s pretty much it. After setup, you’ll notice the design of the Intercooler doesn’t obstruct the Nintendo Switch’s use of HDMI or power cables. They’re capable of exiting outside the backside of the cooler without any extra interference. Once you’ve attached the dock panel to the Intercooler to use as a cover, you’re ready to play. 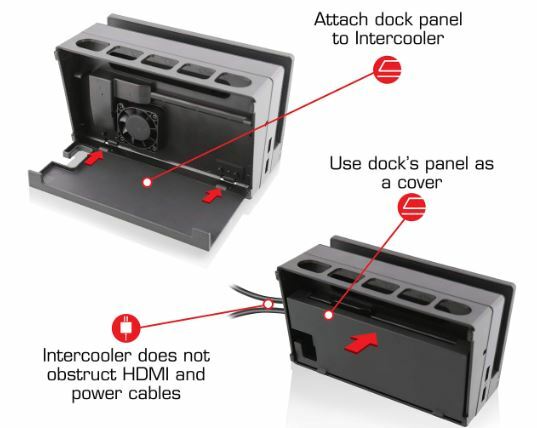 The Intercooler also adds a bit of adaptability to your docking station. The angled design of its faceplate allows for the console and docking station to be placed both vertically and horizontally. You can even stack other things on top of the Nyko Intercooler’s faceplate, providing an extra boost of placement options. If you want to remove the Nyko Intercooler from your Switch, doing so takes about 10 seconds. And though it should be obvious, a docking station is not included with the Intercooler. Aftermarket cooling equipment often prevents you from replacing your fan. The Nyko Intercooler does not make that mistake. If you were feeling ambitious, there’s even the possibility of installing a slightly larger fan, though it certainly would not be necessary. The Intercooler aims its airflow with precision, and that simplicity is a large part of its charm. No additional power supply is needed because the Nyko Intercooler’s modest fan can get all the power it needs through USB. The included USB cable is quite short, approximately 5-inches. It provides enough cabling to reach your docking station, and it’s also detachable. That means it can be replaced with another USB to Micro-USB cable, if you see fit. 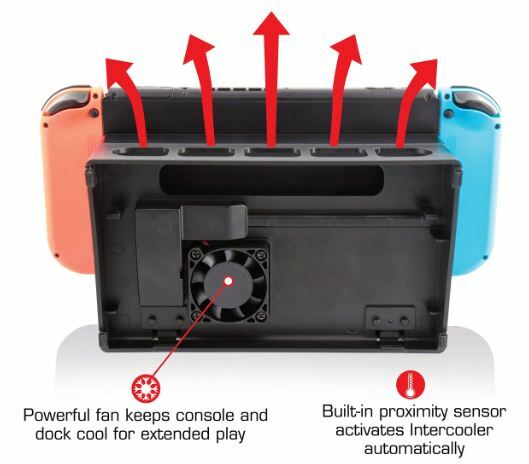 Who Should Choose the Nyko Intercooler for Nintendo Switch? You’ve probably noticed the Nintendo Switch will get warmer while docked. That heat can be magnified when you stuff the Nintendo Switch into an entertainment center with minimal airflow. It’s impossible to say how effective a device like this will be at prolonging the lifespan of your Nintendo Switch. A responsible estimation might be approximately 2-years of added life. The Intercooler clearly isn’t for everyone. Some people may not see themselves using the Nintendo Switch in two or three years. If that describes you, then you don’t need extra cooling for your console. On the other hand, even if you don’t particularly care about its fan, the Nyko Intercooler makes it a bit easier to stack the Switch within an entertainment console. Do you need the Intercooler? Need might be too strong of a word. But it certainly can’t hurt to have. Once you’ve got it installed, you don’t notice it’s even there. That general invisibility is no small part of what makes the Nyko Intercooler such a compelling docking attachment. If you’re someone who wants their console to be operational in five or ten years, the Nyko Intercooler for the Nintendo Switch is basically a cheap insurance policy that can help give you what you want.